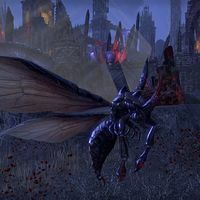 Skein Wasps are Mephala's Daedric imitations of giant wasps, and are native to the Spiral Skein. Their attacks are identical to their Tamrielic counterparts, and can spawn young wasps to aid them, which may become bonded to you after the wasps death. They are later summoned to stop Valsirenn from opening a portal out of the Skein. This page was last modified on 5 January 2019, at 22:07.